The spin-photon memory is a non-volatile high-speed optical memory, which utilizes the magnetization reversal of nanomagnet by spin-polarized photo-excited electrons. Fig.1 Fabricated spin-photon memory on GaAs substrate. On top of AlGaAs waveguide (height 1 um, width 4 um) pn-GaAs photodetector (4 um x 4 um)was fabricated. On the top of the detector100 nm x 80 nm Fe nanomagnet is made. The memory consists of micro-sized memory cells integrated on a semiconductor wafer. A bit of data is stored by each cell. Each cell consists of semiconductor-made photo detector and nanomagnet made of a ferromagnetic metal. The nanomagnet has two stable magnetization directions. The data is stored as a magnetized direction in the nanomagnet. As an example, Figure 1 shows the spin-photon memory fabricated on GaAs substrate. The wavelength of light is 750-800 nm. The AlGaAs waveguide is transparent and it is used to deliver light to the memory cell. GaAs absorbs light. 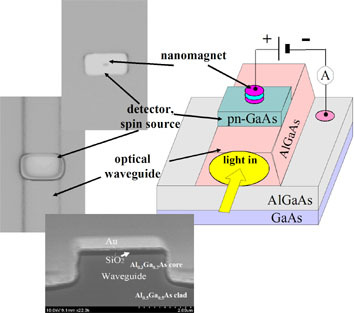 Light excited spin-polarized electrons in GaAs detector, which are injected into Fe nanomagnet. For the data recording, the magnetization direction must be reversed by optical pulse. Figure 2 shows operational principal of recording. The circularly-polarized optical pulse is absorbed in the semiconductor detector creating spin-polarized electrons. Under applied voltage these spin polarized electrons are injected from the detector into the nanomagnet. The spin transfer torque is a consequence of the transfer of spin angular momentum from a spin-polarized current to the magnetic moment of a nanomagnet. If the torque is sufficient, the magnetization turns and the data is memorized. Due to the optical selection rule, the spin-polarized electrons can be created only by the circular polarized optical pulse The linear polarized light excites equal amount of electrons of both up and down spins, therefore there is no net spin polarization, the current injected into nanomagnet is not spin polarized and there is no spin torque. Figure 3 shows integration of two memory cells and explains principle of high speed recording. There are two waveguide inputs. One input is for data pulses and one input is for the clock pulse. The clock pulse is used to select for recording a single pulse from sequence of the data pulses. Polarization of data pulses and clock pulse are linear and mutually orthogonal. Optical paths were split that each memory cell is illuminated by the data pulses and the clock pulse. The lengths of waveguides are adjusted so that the phase difference between clock and data pulses is lambda/4 at each memory cell. At the first memory cell the clock pulse came at the same time with first data pulse. Therefore, these two pulses combined into one circularly polarized pulse. Since only first pulse is circularly polarized, only this pulse excites spin polarized electrons, changes magnetization and is memorized. All other data pulses are linearly polarized, they do not excite spin polarized electrons and they have no effect on the magnetization. For the second memory cell, the clock pulse is slightly delayed relatively to the data pulses and it comes together with second data pulse. Only the second pulse is circularly polarized and can be memorized by the second memory cell. Therefore, each data pulse can be memorized by individual memory cell. The closer the pulses can be placed relatively to each other, the more data can be transformed through one line and the faster recording speed of memory can be achieved. The minimum interval between pulses, at which a pulse can be recorded without any influence of nearest pulse, determines the recording speed of the memory.